One of the best things about Botox is the fact that no true preparation is needed for your appointment. However, there are some things that you can do to improve your results and minimize any risk of bruising that can occasionally occur from getting injections. Avoid taking aspirin or using any products that contain Aspirin such as Ibuprofen, Aleve, Motrin, and most over the counter pain medication other than acetaminophen (Tylenol) two weeks prior to your treatment. Avoid drinking alcohol two days before the treatment. Be patient. Remember that it takes three or more days to see an effect from Botox. Don’t expect the injection to last forever, the effects of Botox last about three to four months before it’s time for another appointment. Be honest with your provider- If you are taking any medication that thins your blood, including (but not limited to) Coumadin and Plavix, or if you smoke- your likelihood of bruising is increased. Your SHAW Center provider will apply Arnica Montanna to the treatment areas to reduce the incidence of bruising, and will suggest further treatment of Arnica Montanna at home to assist in the decrease of bruising. Think long term. With repeated treatment, wrinkles often appear less severe over time because the muscles are trained to be less active. In younger patients, Botox may even prevent minor wrinkles from forming. After your Botox appointment, you are free to go back to your daily activities (go back to work, go out to dinner/lunch, parties etc). 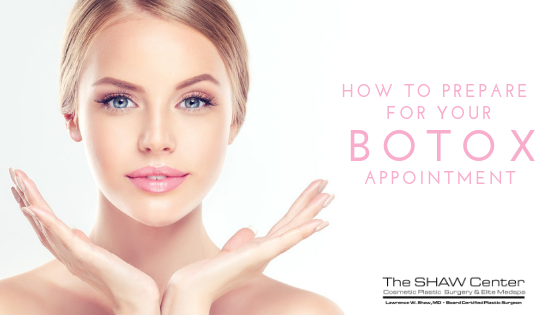 However, The SHAW Center does not recommend exercising or lying down (flat on a bed) for four hours after your Botox treatment. If you have Botox injected around the eyes, you should avoid rigorously rubbing towards your eyes for a few days after your treatment. Dr. Lawrence Shaw is a double board certified plastic surgeon in Scottsdale, Arizona with over 30 years of aesthetic surgical experience. Dr. Shaw’s excellent reputation is attributed to his uncompromising commitment to the highest standards of patient care, rational decision making and meticulous surgical technique. He has thousands of satisfied patients throughout Arizona, the United States and beyond. Dr. Shaw is the founder and medical director of The Spa at The SHAW Center which has grown into a Premier Medical Spa offering non-invasive, anti-aging services ranging from advanced skin care, neurotoxins, injectable facial fillers, non-invasive fat reduction, cryotherapy, IV infusion therapy, to lasers for vaginal rejuvenation, hair removal and skin rejuvenation. At The SHAW Center, over the last 30 years, Dr. Shaw has created an environment to attract the best team possible to promote innovation and exchange ideas to fulfill our mission. Dr. Shaw’s vision is to deliver the utmost in surgical and nonsurgical cosmetic care and patient experience. We strive to be the plastic surgery and medical aesthetic spa of choice where we consistently meet or exceed our patient’s expectations. Caring for our patients, assessing and realizing aesthetic goals in a safe, comfortable environment is always our top priority. We provide compassionate personalized care that extends well beyond the treatment and recovery period leaving our patients with a positive lifelong lasting impression. It is personally gratifying to see how many patients from the 80’s and 90’s are still our patients and now referring their children to Dr. Shaw and our office. Our patients truly become “patients for life” and part of The SHAW Center family. We invite you to come meet our incredible team to explore and realize your aesthetic dreams.